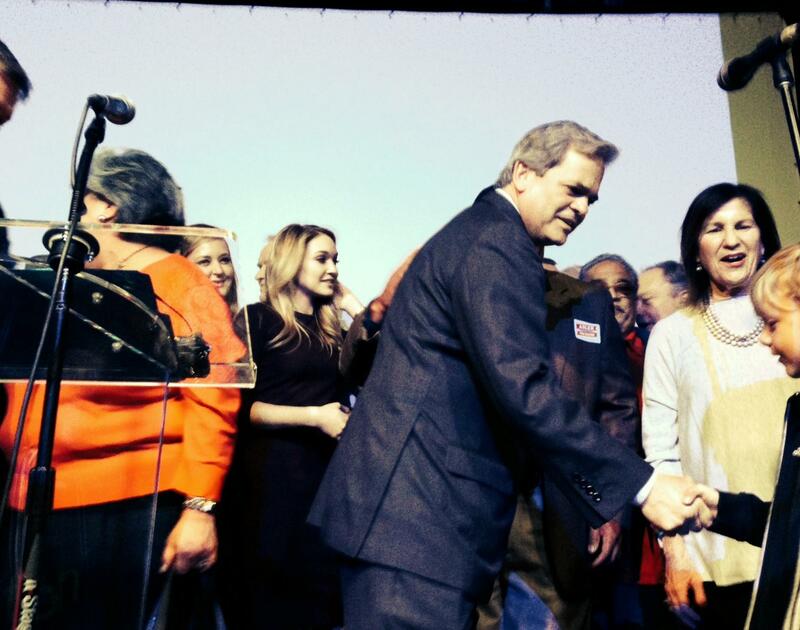 Mayor-elect Steve Adler shakes a young supporters hand at his Election Night party. 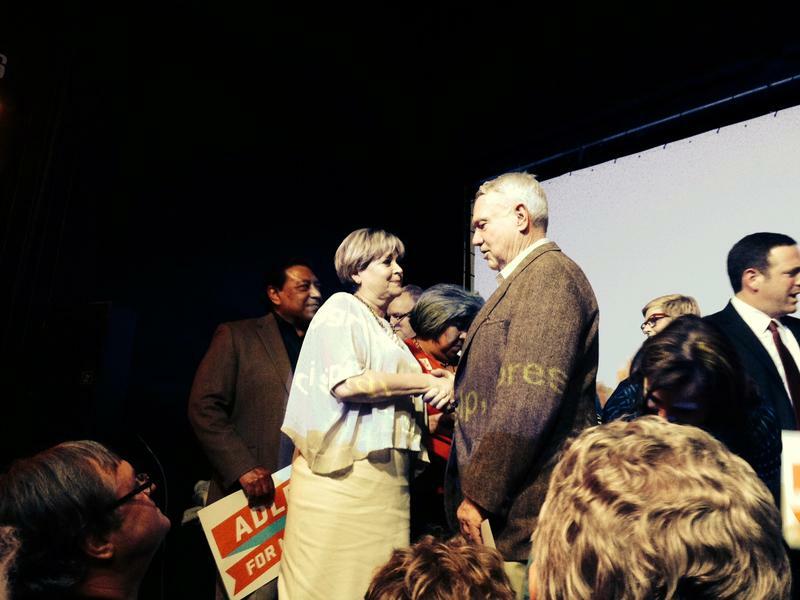 Adler's wife Diane Land shakes hands with Mayor Lee Leffingwell. After years of build-up and build-out, tonight the Austin City Council will finally transfer from an at-large, seven-member council to a geographically elected council with 10 members. Two of the council seats were decided on Election Day in November – Delia Garza won the District 2 seat and Ann Kitchen won District 5. Council Member Kathie Tovo, after nearly beating fellow Council Member Chris Riley with 49 percent of the vote, won the District 9 seat after Riley’s November concession. The remaining seven races, and the race for Mayor of Austin, will be decided by today’s runoff elections. District 6 – Don Zimmerman defeats Jimmy Flannigan with 51.21 percent in a close race. Flannigan carried Election Day, but his 48.79 percent in total runoffs wasn’t enough to win the seat. District 7 – Leslie Pool wins with 66.23 percent over Jeb Boyt’s 33.77 percent. District 8 – Ellen Troxclair wins the seat by less than 60 votes, earning 50.23 percent of the vote against opponent Ed Scruggs, who got 49.77 percent of the vote. District 10 – Sheri Gallo defeats Mandy Dealey with 54.76 percent of the vote. Dealey got 45.24 percent of the vote. Update (10:01 p.m.): Ora Houston and Leslie Pool are poised to take Districts 1 and 7 – With just over 78 percent of precincts reporting, here's a look at the front-runners in the Austin City Council runoff elections. Houston leads in D1 with 73.76 percent of the vote, compared to opponent DeWayne Lofton's 26.24 percent, the largest margin in the runoff elections, though it's unclear if Lofton has conceded to Houston as of yet. Earlier this evening, Jeb Boyt conceded to front-runner Leslie Pool in the race for the District 7 seat. Pool currently leads with 65.82 percent to Boyt's 34.18 percent. Greg Casar leads in District 4 against opponent Laura Pressley, 64.57 percent to 35.43. Meanwhile in District 3, Pio Renteria has slightly extended his lead against opponent Susana Almanza, 58 to 41 percent. Sheri Gallo leads District 10 with 54.72 percent to Mandy Dealey's 45.28 percent. Don Zimmerman and Jimmy Flannigan are still close in District 6, with Zimmerman leading Flannigan 52.3 percent to 47.70 percent. Ellen Troxclair and Ed Scruggs are in an even closer District 8 race. Troxclair leads with just over 51 percent of the vote over Scruggs' nearly 49 percent. Update (8:36 p.m.) :Mike Martinez concedes in race for Mayor of Austin – At his Election Night party downtown at the Rattle Inn, Martinez told KUT's Joy Diaz that he's conceded the race. "I’m not going anywhere I love this city, and I called Steve [Adler] and told him I’m 100 percent committed to supporting him and his vision for Austin. We’ll be there every step of the way if he wants my help," Martinez said. "He probably doesn’t need it, but I offered it to him…He and I are going to visit in the next few days and kind of talk about how we continue to love Austin and make Austin the best city in the world moving forward." Below is the full audio from Martinez's interview with KUT. Original Post: (7:13 p.m.) Steve Adler leads Mike Martinez in the race for Mayor of Austin – Adler has 69.79 percent of the vote according to early voting numbers. Martinez so far has 30.21 percent. Ora Houston leads the race for District 1 – Early voting numbers put Houston ahead of DeWayne Lofton with an overwhelming 73.99 percent of the vote. Lofton garnered 26.61 percent. Sabino “Pio” Renteria leads in District 3 – Renteria has 56.97 percent of the vote, while Susana Almanza has 43.03 percent of the vote, according to early voting numbers. Almanza led her brother, Renteria, after Election Day in November 20 percent to his 18 percent. Greg Casar leads District 4 – The 25-year-old candidate leads longtime Austin advocate Laura Pressley with 63.53 percent to Pressley’s 36.47percent. Don Zimmerman leads Jimmy Flannigan in D6 – The two candidates were split on Election Day in November by less than a percentage point. Zimmerman leads by a slight majority 52.11 percent to Flannigans 47.89 percent. Leslie Pool showed up Jeb Boyt in District 7 early voting – Pool garnered 65.71 percent of the vote, compared to Boyt’s 34.29 percent. Ellen Troxclair and Ed Scruggs are neck-and-neck in District 8 – Ed Scruggs got 48.29 percent of early votes, but Troxclair had a slight edge in early voting with 51.71 percent. Mandy Dealey trails in District 10 early voting– Dealey got 45.06 percent of the vote, while opponent Sheri Gallo garnered 54.94 percent of the vote.